Orlando Street Railway Company – Street Railway down Church Street toward Orange Avenue. Brick building in the back ground was Bumby Hardware (Now Hamburger Mary’s). SunRail will arrive in Central Florida before long. With high-tech and environmentally friendly trains, commuter rail will seem like a new transportation solution for Orlando. But, it won’t be the first time residents have travelled locally on tracks. We’ve done this before many years ago and for very different reasons. Our first attempts at what could be called commuter rail was about 125 years ago at a time when the automobile was just being invented. Orlando started to grow once the railroad was completed in 1880. Citrus was developing as an industry and now had a way to ship in quantity outside of the area. Six years after the railroad, the Orlando Street Railway Company was established for residents to have way to move around town. Tracks were laid down Church Street from the train depot to and along Orange Avenue. A trolley pulled by two mules carried Orlandoans up to Lake Ivanhoe. Service on the railway was haphazard. The conductor, Ernest Mills, for the single trolley followed a schedule perhaps unknown to his passengers. Historian Eve Bacon wrote that Ernest gave his friends free rides and would often stop at the end of line on Marks Street for a game of marbles. These unplanned stops caused service delays. Sometimes they would catch snakes in the woods, tie the live snakes to the back of the trolly, and drag them back to West Church Street to sell to the local taxidermist. Orlando life was a bit more rustic in the 1880s. In 1893, the unreliable service led to the city to revoke the Orlando Street Railway Company’s franchise, and later ordered the tracks removed. Dinky Station – Winter Park train station for the Dinky Line located on Lake Virginia in late 1800’s. A few years after the mule powered street railway, another commuter rail began. This one proved to have longevity. 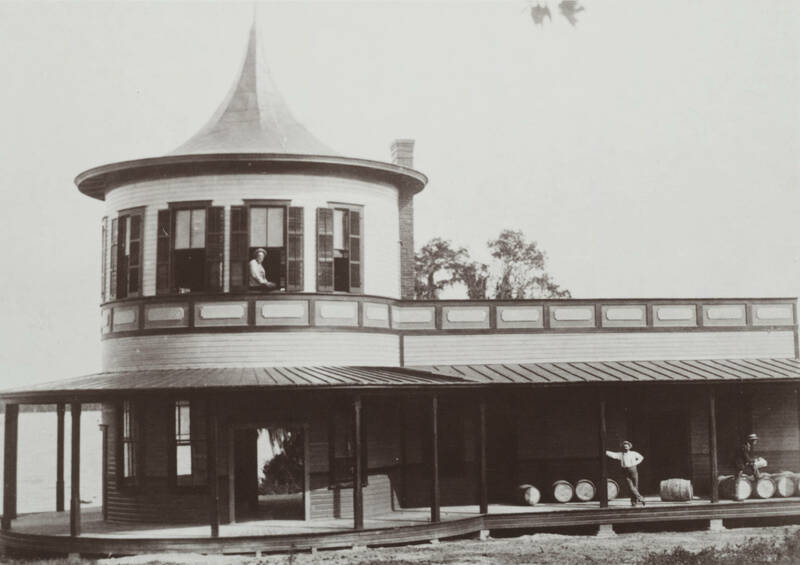 In 1889, the Orlando and Winter Park Railroad started running from downtown Orlando winding by Lake Highland and Lake Formosa up to Rollins College. Now part of Rollins’ heritage, it was nicknamed the “Dinky Line” by students that for 15 cents commuted between Orlando and the Winter Park campus. Traveling at speeds of 6 1/2 miles per hour, the train easily derailed because the tracks were laid on sand. Much of the route between Orlando and Winter Park was wooded and undeveloped. If service was not interrupted by derailment, stray cattle blocked the tracks and delayed service until the conductor stopped to shoo the cows away. In addition to passengers, the Dinky Line carried freight especially later when automobiles became the norm. The line ran for over 70 years. By the 1960s, the wooded areas along Lake Highland and Lake Estelle had become prime real estate lined with upscale homes. Its last route ran in 1967 and the tracks were removed a year later. Today, we have reminders of the Dinky Line with portions of the route making up the Orlando Urban Trail. In Winter Park, the train station once stood on Lake Virginia at Dinky Dock Park. This post originally appeared in Bungalower. orlando retro blog is updated a few times a month. Follow on Facebook or Twitter for updates.